Is it ever okay for designers to manipulate people? Our job as designers isn’t to convince people to do things they do not want to do. It is to persuade them to act now and act with our clients rather than the competition. Have you ever considered the morality of your job? After all, the chances are that your role involves persuading people of something. To complete some call to action. And here is the thing – you are good at it. We have incredible power to manipulate people from the words we use to the layout of a design. We can make people look at things we want them to look at and click things we want them to click on. We use emotion, psychology and design to nudge people in the direction we want them to go. But should we? Manipulating people in this way is a dangerous road to go down. Users are smarter than ever before and more aware of the tricks we use to manipulate them. These “dark patterns” are something we moan about to friends and family. Checkboxes that designers tick by default. Items that we add to their shopping baskets automatically. But even if we succeed in manipulating people into doing something they do not want to do, it is a false economy. Manipulating users causes nothing but anger. 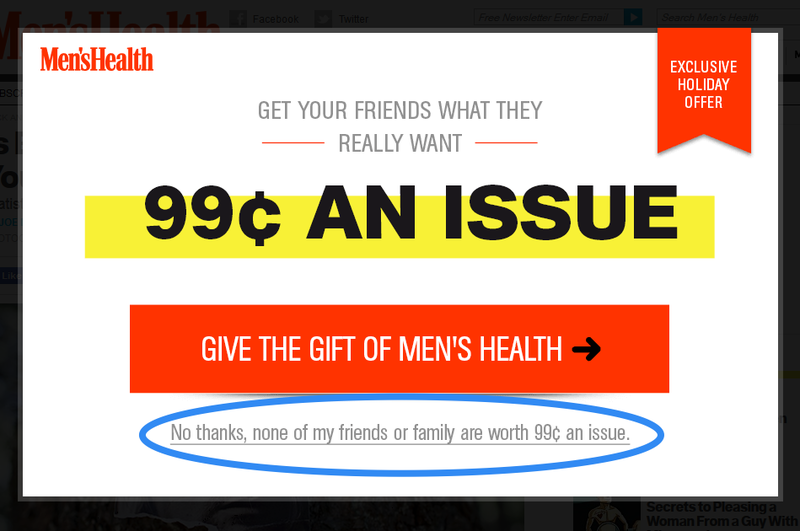 Persuading users to sign up to a newsletter is the most common example of this. There are all kinds of techniques we can use to get people’s email addresses. But is it worth the effort? When we trick people into doing something like signing up for a newsletter they will suffer from “buyer’s remorse”. They regret handing across their data and become frustrated when they try to unsubscribe. This damages your reputation, especially if they share their frustrations. Of course newsletters are not the only thing we manipulate people into doing. In the end the cost of our manipulation can be high. Whether it is in damaged brand or higher support costs. People will complain both to us and to others. So should we all make a stand and refused to do anything that manipulates users? Well, it is not quite that black-and-white. Is it ever okay to manipulate people? Let’s be honest, it is our job to reflect our clients in the best light. This involves some degree of persuasion that we cannot avoid. At least not unless you work for an utilitarian organisations such as government. So where is the line? When is it okay to “manipulate” people? I believe it comes down to user intent. What is the user trying to achieve? We should not be persuading users to do something against their will. We should not be persuading users to do something against their will. But I do believe it is okay for us to persuade them to act now, rather than put it off until later. I also believe it is acceptable to persuade users to take action with you, rather than a competitor. They are too busy or too lazy. It is our job to make acting easy. They want to ensure they have the best deal. It is our job to persuade them that they do. They worry about making a mistake. It is our job to reassure them. Charitable giving is a great example of this. We all say we want to give to charity but we don’t. That is because there are all these barriers that we need to overcome to give more. Barriers like time and money. If we can make giving effortless and the expense invisible (or even reduce it) then we have done our job. For example, making charitable donations by spending money on a credit card. That is exactly the kind of thing the sponsor of this post offers. It requires no effort and the cost is invisible. You see as human beings we are conflicted. We don’t always do what it is we want to do or even what is in our best interests. There is a battle raging in people. A battle that we as designers can help with. It is the battle between the intellect and the lizard brain. The lizard brain is the most ancient part of the human brain. It lives in the moment and fixates on the most basic survival traits. There is a battle raging in people between the intellect and lizard brain. As designers we can help the intellect win. It is the lizard brain that stops us dieting because it lives in the moment and doesn’t care about consequences. It is the lizard brain that prevents us buying something that we can afford, because it likes the security of money. The lizard brain is shortsighted and most of all lazy. It is our job as designers to help people overcome the lizard brain. To help people do what they want to do. Whether that is charitable giving, organ donation or going on vacation. I have no problem tricking the lizard brain so that people can overcome the barriers preventing them from acting. But we need to be careful we are not tricking ourselves. There is a fine line we need to walk. Pressuring people and helping them overcome their own barriers are two different things. But it can be hard to spot the difference sometimes. Am I helping somebody overcome an irrational hesitancy of buy that HDTV we are selling. Or am I pressuring them to buy something they cannot afford? It is these kinds of moral questions we need to wrestle with as designers. Aspiration brings you a high-yield checking account you can't get anywhere else. The Aspiration Summit Checking Account was named the 'Best Checking Account in America' by Money magazine. It lets you earn up to 1.00% APY and provides unlimited ATM fee reimbursements. In addition, there are no monthly fees, no minimum balance requirements, and no minimum deposit requirements. The only money Aspiration makes comes from the "tips" you believe are fair. Plus, they give 10% to charities helping struggling Americans build a better life.